This poem reads like a riddle in the Anglo-Saxon poetic tradition evidenced in Beowulf and the Exeter Book. A common characteristic is for the object to be the speaker describing itself through personification, metaphor, and double entendres (often sexual). This poem certainly has many of these figures of speech, pointing towards something that I will not reveal to avoid reducing interpretations of this puzzling piece. In his interview with Brian Kim Stefans, Poundstone discusses part of his method. “The poem text is a so-called travesty” generated from “a large and diverse assortment of quotes on that theme,” the color white. “The program outputs a kind of marvelous rant on the chosen theme, from which I pick the phrases I want to use in the poem” (pg. 7). 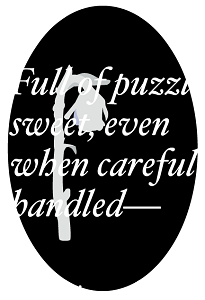 Poundstone’s process doesn’t end here, since the phrases are placed into Flash, organized, formatted, scheduled, and juxtaposed with an image of a wilted rose. As seen in his other works, the graphic design of this poem is impeccable, pulling together diverse visual and textual elements to produce works that look like emblems.